Olympus has been supplying robotic and automation systems for over 25 years into various industries including fabrication, die casting, plastics injection moulding and assembly. We can supply robots for a single process such as welding or deburring as well as complete assembly line solutions for the handling and palletising of parts. Increasing productivity – robots do not need the down-time that humans require, and they can extend your production hours every day. Accuracy and Repeatability – a robot can follow a programmed path very accurately with repeatability as good as 0.1mm. This gives consistent high quality in applications such as welding and cutting. Health & Safety – workforce can be removed from hazard points in your factories. Universal Robots have introduced a range of cost-effective collaborative robots which have opened up the world of robotics to the SME market, as well as providing additional benefits for larger businesses. 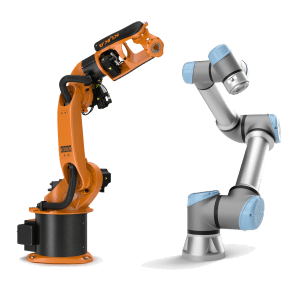 Kuka offers a large range of robots with payloads from 5kg to 1000kg, that can be used for many applications including welding & cutting, plastics moulding, die casting, assembly, packing and palletising and much more. As system integrators we design your entire robot system to your requirements, providing and commissioning vacuum and mechanical grippers, conveyors, turntables, and other tooling as required. Olympus is proud of its bespoke solutions using quality products, and long-term support of our customers.